Between July 1969 and December 1972, six two-man Apollo crews landed on the Moon, fulfilling President Kennedy’s goal of “landing a man on the Moon before this decade is out, and returning him safely to Earth,” and opening a door to an understanding how the Moon formed and how it has evolved over the last 4.527 ± 0.010 billion years. 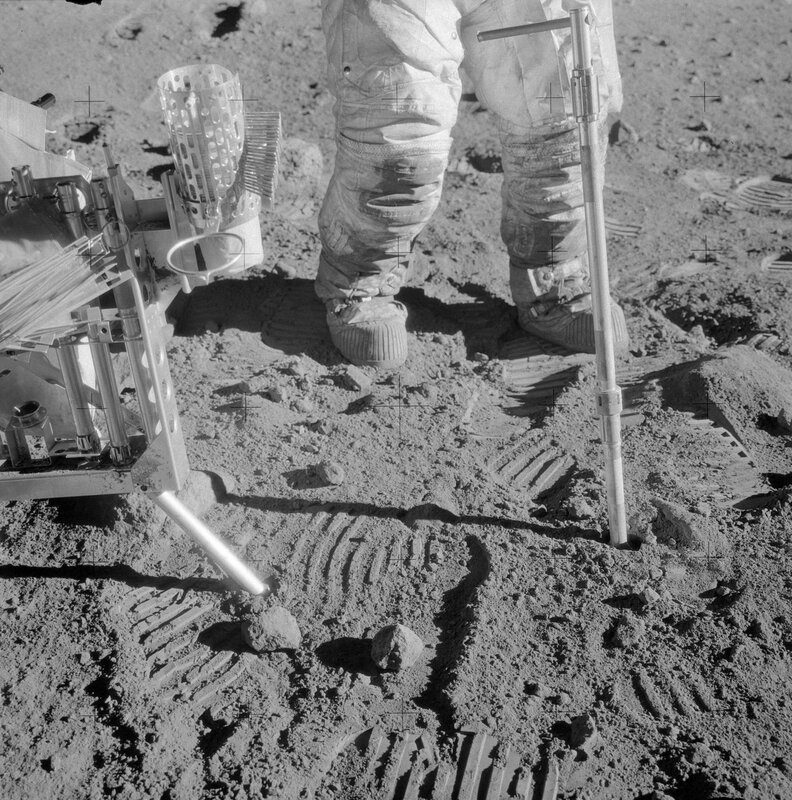 The six crews brought home about 380 kg of samples, including individually selected lunar rocks weighing up to 11.2 kg each, 1 kg lunar soil samples from dozens of selected sites, and various core tubes and core-stems to provide vertical profiles of the soil layer. They also took over 6500 Hasselblad images, most of them documenting the sampling sites, and providing ‘before’ and ‘after’ views of the spot from which each sample was taken. Once back in Houston, the sample containers were carefully opened inside glove boxes for photography, weighing, and initial examination. As part of that initial examination, the colors of each lunar rock and the color of each bag full of lunar soil was determined by comparison with the then-current edition of the Geological Rock-Color Chart produced jointly by Munsell Color and the Geological Society of America and ultimately derived from a Rock-Color Chart produced by a committee of the US National Research Council in 1948. 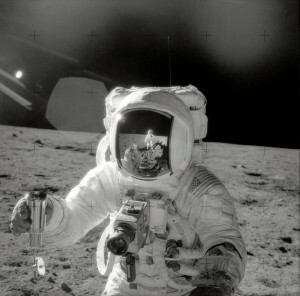 Astronaut Charles M. Duke Jr., Lunar Module pilot of the Apollo 16 mission, collecting lunar samples. 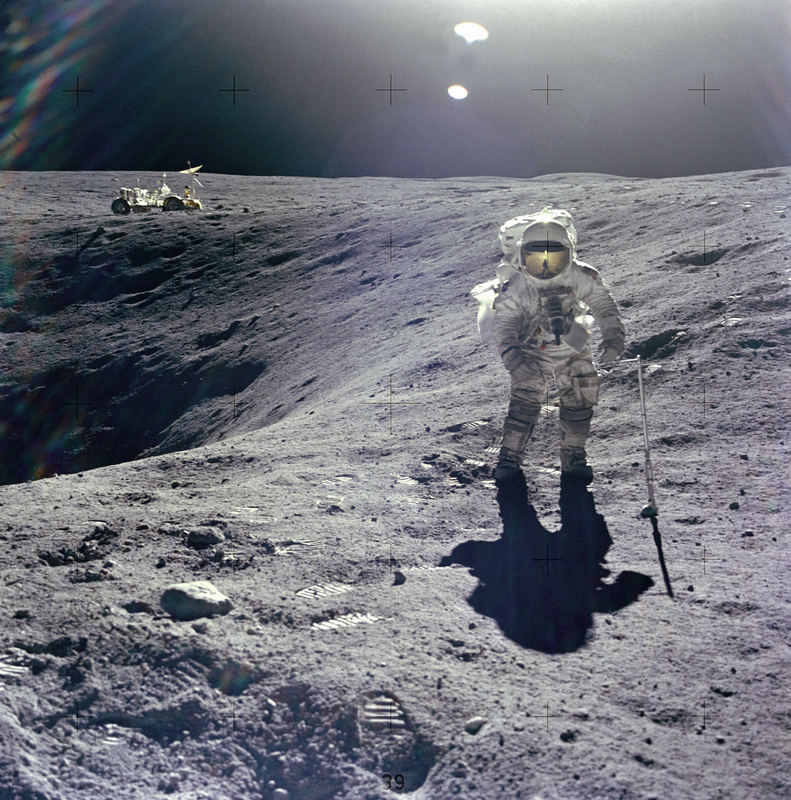 Among the most important samples were three cores drilled into the lunar surface to depths of over 2 meters. 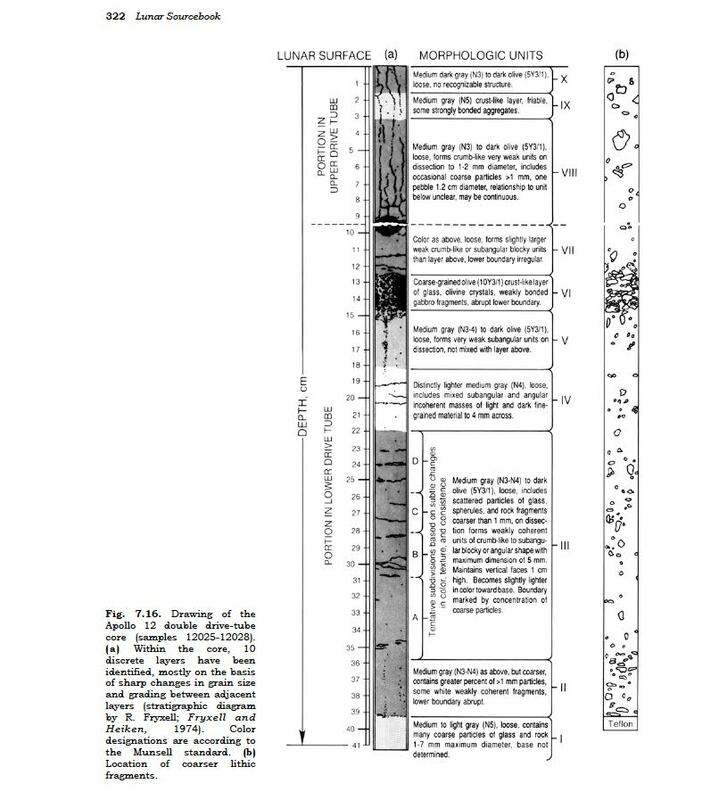 The purpose was to obtain detailed stratigraphy of the lunar soil layer at a single location at each of the last three landing sites. The lunar soil – called regolith – is the product of billions of years of impacts, large and small. At first, even the smallest impacts hit the local bedrock, shattered it and spread the debris out to a distance dependent on the size of the particular impact. Gradually, a thin layer of regolith began to accumulate. The smallest impacts no longer reached bedrock but did break or chip larger fragment in the layer and, by scattering debris outward, left a crater. Small impacts produced small craters; large impacts produced larger craters and scattered ejecta to larger distances. The net result was a lunar regolith layer composed on interleaved ejecta blankets, with considerable mixing. Careful examination of the deep cores gave insights into the frequency of impacts and, by determining colors of layers in the core, insights into differences in the mineralogy of the various layers. A 2-cm core tube being driven into the lunar soil at Bench Crater site by Apollo 12 astronaut Allan Bean. 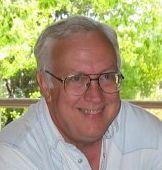 Grant Heiken was a member of the team that examined the lunar core samples when they arrived at the Lunar Receiving Facility in Houston, within a day or two of the crews splashdown in the Pacific. Grant said they used the Munsell color charts for nearly every lunar sample, especially for the soils. They used the charts (the large professional version in a 3-ring binder) when they were dissecting the core samples. At that time it was one way of being consistent instead of saying something like “dark grey.” It was also one way dealing with different lighting when working on the samples. Grant still has a Munsell notebook in his desk, which he’s used for years in the field. Roald Fryxell, a meticulous stratigrapher who had worked mostly with archeologists on the stratigraphy of archeological sites, worked with Grant when they were dissecting the cores and established the protocol of using the Munsell color charts when dissecting lunar cores. For example, this image from the Lunar Sourcebook has a description of the Apollo 12 double drive-tube core, with color designations according to the Munsell Standards. Today, NASA is still using Munsell Color Standards for the International Space Station. 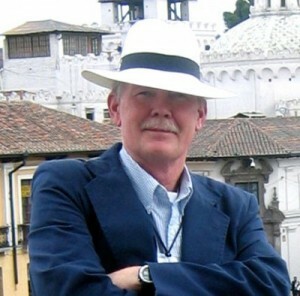 Eric Jones is one of the editors of The Apollo Lunar Surface Journal, an online record of the lunar surface operations conducted by the six pairs of astronauts who landed on the Moon from 1969 through 1972. The Journal is intended as a resource for anyone wanting to know what happened during the missions and why. Additional information came from Grant Heiken, who was a member of the team that examined the lunar core samples when they arrived at the Lunar Receiving Facility in Houston. Eric Jones and Grant Heiken are the authors of the book On the Moon: The Apollo Journals which explains how the Apollo crews learned to work on the lunar surface.